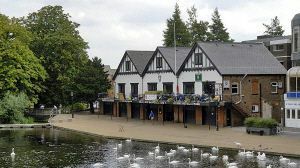 The iCycle's Club House is the Bedford Rowing Club. We use the Club House every Saturday evening for an informal social gathering, and for functions and meetings, and it is the meeting point for the Sunday Club Run, and some of the Training events. The Club House has a licensed bar, serving draught beers, wines and spirits at Club prices, and tea and coffee is always available, especially welcome on cold winter mornings before the Sunday Club Run or Training rides depart.